Galerie Bernheim-Jeune, Paris (acquired from the artist, 1912). Lonce Rosenberg, Paris (acquired from the above). Anon. sale, Htel Drouot, Paris, 21 March 1934, lot 39 (illustrated). F.-J. Beer, Bonnard, Marseille, 1947, p. 70, pl. 50 (illustrated; as Chute d'eau Grasse). J. and H. Dauberville, Bonnard, Catalogue raisonn de l'oeuvre peint, Paris, 1965, vol. II (1906-1919), p. 288, no. 731 (illustrated). Paris, Galerie Bernheim-Jeune, Bonnard. Oeuvres rcentes, June-July 1912, no. 9. South Hampton, Parrish Art Museum, Painting Naturally: Fairfield Porter and his Influences, April-June 1984. Bonnard rented the Villa Antoinette in the small town of Grasse from January to April in 1912. During his brief stay in Grasse, before his move to Vernonnet in the Eure, he produced several works which highlighted the beautiful environment in which he lived. He displayed thirty-one of his Oeuvres rcentes in a June exhibition at Galerie Bernheim-Jeune, the present work included. Bonnard once said "For every landscape you need a certain amount of sky and ground, water and verdure, and it is not always easy to establish their interrelation right from the start" (quoted in Bonnard, exh. cat., Galerie Salis, Salzburg, 1991, p. 45). 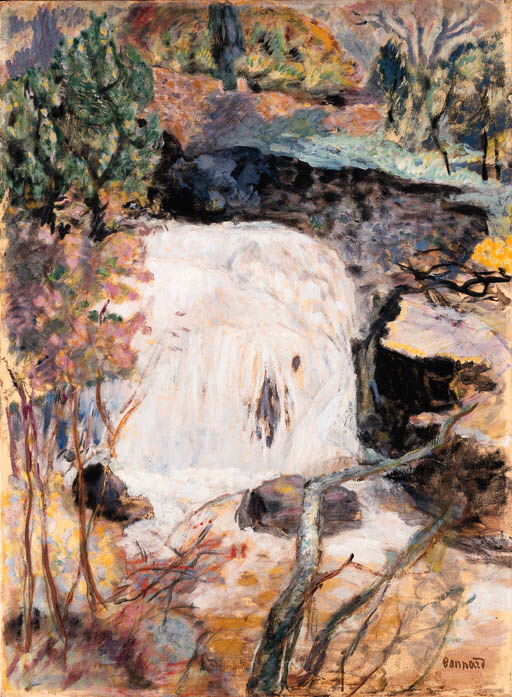 While Bonnard had painted many views of the cultivated gardens that his family kept at Grand-Lemps, their estate in the Dauphin province, he preferred not to see the hand of man in nature and purposefully looked for scenes such as in the present work. Michel Terrasse described the influences that Bonnard's surroundings had on his work and wrote, "A born colourist, he was sensitive not only to bursts of colour but equally to the quality of the air, to the vibration, the texture, the perfume of things" (M. Terrasse, Bonnard at Le Cannet, London, 1988, p. 11).